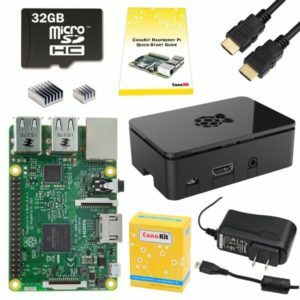 This entry was posted in Linux, NEMS, Raspberry Pi, Server Administration by Robbie Ferguson. Bookmark the permalink. 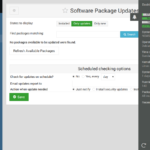 Check_MK was removed from NEMS Linux with the 1.4 branch, as per the release notes. Please try the included Adagios interface, which is much more current. Check_MK fell too far behind and the developer was taking a different direction. Hi Robbie, I get the same messages here. I was running 1.2.3 for a couple weeks, backed up configs, created a new sd with NEMS 1.3 and walked throug the nems-init side, no errors. 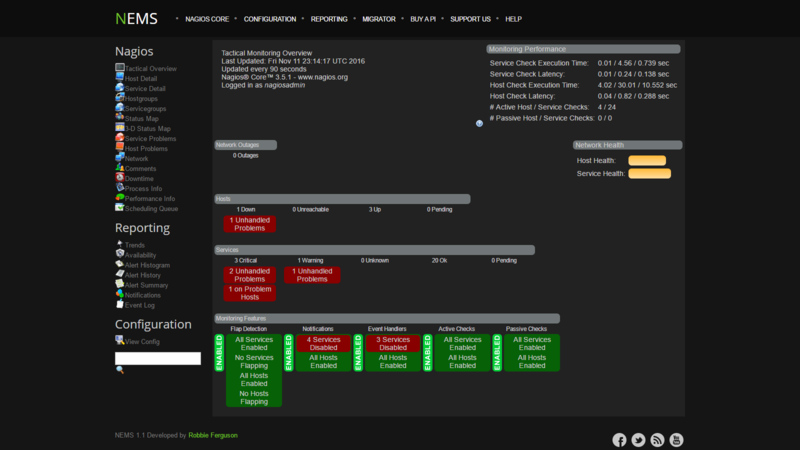 I can access the MOTD page and can log in into Nagios but any attempt to go into config ends with SSL errors. Can i help more to track this issue? Yes, the more users’ systems I have access to (be it directly or vicariously through instructions), the faster I can write a patch for the fix. Thanks! I have the same problem as Dave. I cannot access NEMS 1.3 with Chrome, Edge or IE. I have had NEMS installed before but this is a new install with new IP. I cannot access the System settings tool, SSL config was filled out completely. Is it possible to disable SSL for the page somehow? What’s the actual trouble accessing it? Is your browser allowing you to add an exception? Did you add an exception for the self-signed certificate? No, SSL cannot be disabled for NEMS-SST for security reasons. It transmits highly sensitive information. But I’m here to help figure out what’s going on. 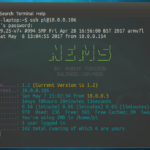 is this the first time you’ve deployed NEMS 1.3? is it on the same IP address as an older installation? your browser may have cached some old certs. can you explain the error you’re seeing? “cannot access” is too vague for me to diagnose. Can you access other SSL components of NEMS, or is it the same result no matter which item you visit? Worst case scenario, are you able to open things up to me so I can SSH in and see what’s up? Also, you may try re-running nems-init if you feel you might have messed up the cert creation. You could PM me the output of nems-init on the community forum if you like to help me see what settings you’re using. Note: re-running nems WILL generate errors, but they won’t break things (eg., user already exists when creating the NEMS user). This is a new deployment. It looks like all pages fail with a similar error. then only cert creation entry I’m not sure about is state, should it be PA or Pennsylvania? Essentially, because it is a self-signed certificate, you need to add an exception. Does your browser provide this option? Guessing this is Chrome? If the “Add an exception” option isn’t there, that wouldn’t make sense as that only happens if you already had a NEMS server (and added an exception previously). But you said you didn’t. If that’s incorrect, it’s in the “I added a permanent exception, then reinstalled or upgraded NEMS, and now I can’t connect.” section of the doc. I have tried Vivaldi, Chrome and MS Edge, none of the browsers offer to add an exception when you click advanced. nems normally uses encryption to protect your information. When Vivaldi tried to connect to nems this time, the website sent back unusual and incorrect credentials. This may happen when an attacker is trying to pretend to be nems, or a Wi-Fi sign-in screen has interrupted the connection. Your information is still secure because Vivaldi stopped the connection before any data was exchanged. You cannot visit nems right now because the website sent scrambled credentials that Vivaldi cannot process. Network errors and attacks are usually temporary, so this page will probably work later. What browser are you using that you are able to add an exception? I can also provide screenshots if that will help. I think it’d help to see what you’re entering during the nems-init process for the cert values. Could you kindly open a bug report in the community forum and then PM me the copy-and-paste from nems-init (run it again)? Doing some searching online, apparently the error you’re receiving can happen if either your computer or the NEMS server’s clocks (date and time) are set incorrectly. Can you confirm both are set correctly? I wanted to try out NEMS, so I got myself a Kingston 64GB micro SDXC card and installed the image on it. 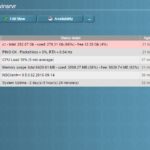 After booting I ran top and saw that the cpu load average was over 8. This slowly decreased and after a day(!) it was down to 1.8. 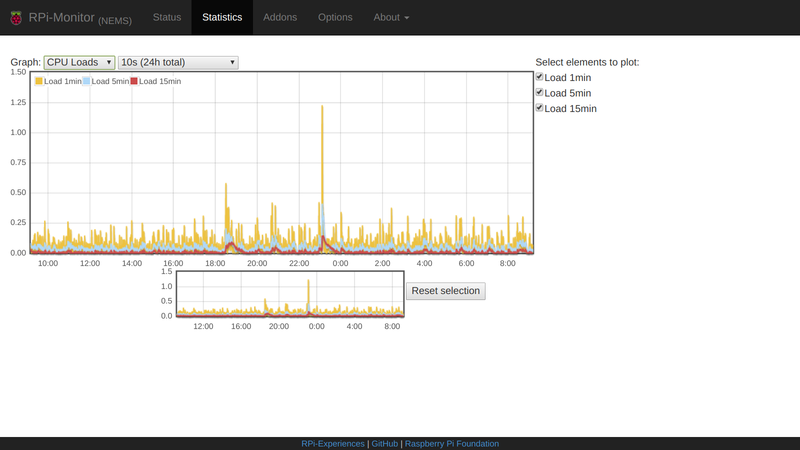 The system behaved extremely sluggish when I ran nems-init. The web interface was almost unusable. I had another 8GB card lying around and installed NEMS on that one. 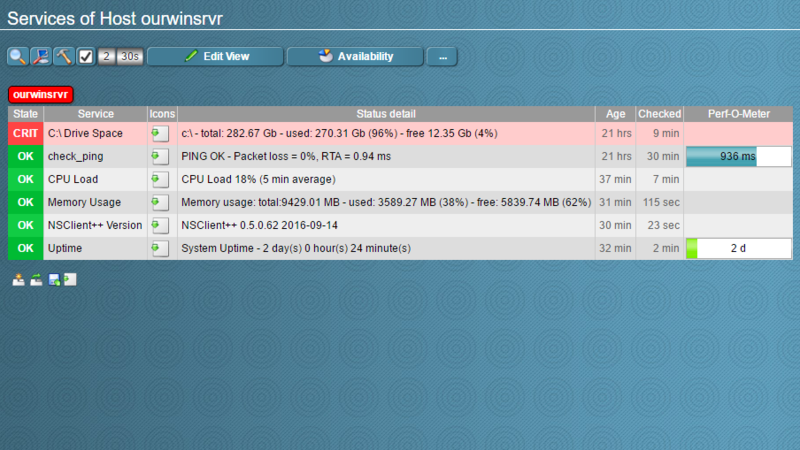 The system worked flawlessly with that card (cpu load around 0.2). So I wonder if the rpi and NEMS can cope with large SD cards? Is there anything I can check to find out what is going on? Unfortunately once you get into > 32 GB SD cards on the Raspberry Pi, it’s going to be hit or miss whether they’ll work or not. I am a software guy, not hardware, but as I understand it it’s because the Pi’s Card Reader is SDHC, not SDXC… or something like that – so essentially it’s only meant for up to 32 GB cards, and some larger will work, but only if you’re lucky. Try replacing that beautiful little Kingston disk with another… pick a good fast one, and go with either 16GB or 32GB. I usually go with a UHS card, even though I don’t think the Pi can take advantage of the full speed… but I still prefer to lean toward the fastest card I can get. OK, Ill get me a 32GB card. My pleasure. Hope you enjoy NEMS! 1) PLEASE include a configuration step in the documentation or add it to the nems-init script, an option to set the locale / keyboard. After I set my passwords, I couldn’t login from my workstation to anything (nconf, webmin, ssh, etc.) except for nagvis (obviously because that password isn’t set during nems-init), but I could login to the pi using a directly connected keyboard. Come to find out, the locale/keyboard is set to GB! Not a big deal, so long as you give the option to change it during setup is all. I didn’t even think to check that at first. 2) Alllll of the login pages except for webmin are over http. Please change everything to be using https by default and have any http requests redirected to https (using mod_rewrite, as an example). It doesn’t matter if people need to generate their own certificates afterwards or maybe you could even have “let’s encrypt” be a part of the configuration process. Logins shouldn’t happen over http *ever*, even if it’s on your local network. 3) Please change the line in your nems-init script where you’re using htpasswd to add the switch “-B”. By not specifying the algorithm, you are allowing the default of MD5 to be used, which is insecure. Thanks for the great suggestions. 1 & 3 will be added to NEMS v1.3 verbatim. So glad you caught that (and shared it) with the keyboard locale. I’d never have thought of that since everything works OOTB here … but someone elsewhere in the world may have trouble – thanks! Re. #2 (SSL), I agree and disagree. First, Let’s Encrypt is for WAN only. Can’t use it for LAN, as far as I know. If you know otherwise, please share. I will add SSL as an optional method of connection, but because the certs will be self-signed for each deployment of NEMS, the user must add exceptions to their browser. I wish there was a better way to force SSL with a valid certificate without needing to setup a hostname, but fact is, this is indeed LAN and unless you’re in a large network where some users may be untrustworthy (eg., MITM) http is perfectly safe / fine in LAN environments. But yes, you’re right: security through obscurity is not security at all. Knowing that “nobody on my network knows how to packet sniff” is not really a safe mindset overall. So it really just boils down to 1) do we force SSL (no, because it’ll cause warnings in the users’ browser) or 2) do we just add SSL as an option and allow the user to select it as the default? Update: bcrypt encryption and keyboard locale settings have been rolled out. 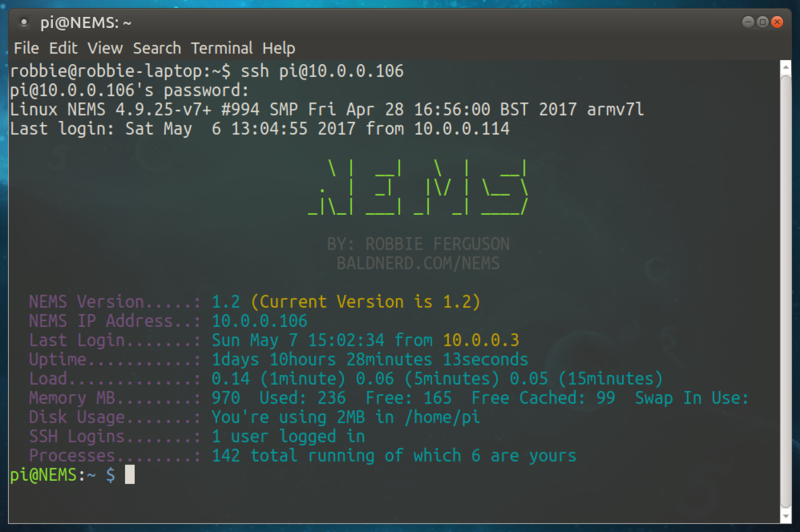 All NEMS 1.1-1.2.2 systems will receive this update within the next 24 hours. How can I change the call NEMS.local to a DynDNS name, so that I can access the web front end from remote ? Thx in advacne for your help and your great support. How Linux-savvy are you? Based on your question itself, and the way you have posed it, I cannot answer in good conscience because I do not have confidence you understand the extreme risk in what you are requesting. Please use best security practices. Well, you’re on the right track! I just don’t want to go giving you dangerous advice that really are bad practice. Please give the Proxy suggestion a try (connect to your NEMS Server by first establishing an SSH SOCKS Proxy to say, your server or other fortified Linux system). I’d suggest using CSF/LFD on the system you are using for the proxy and only allow your own IP access. 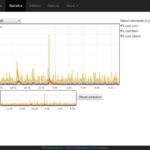 Sorry but how do i go about monitoring another RaspberryPi on the network with NEMS? 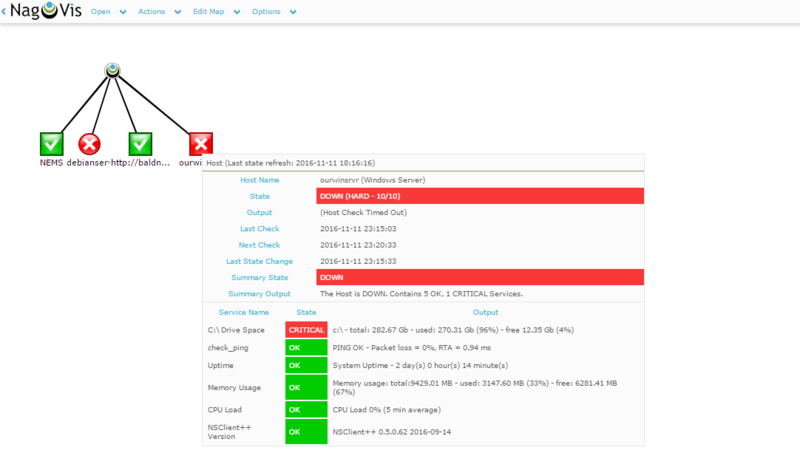 Uptime,CRITICAL – Plugin timed out while executing system call . Any chance there’s a firewall running on the Pi’s you are trying to monitor? What distro is running on them? We could run a command line argument to test. Want to email me SSH access so I can have a look for you? Otherwise, I can write a quick tool to test it, but likely will take a few days to get to. As a test I have installed “nagios-nrpe-server nagios-plugins” and edited “allowed_hosts” with 192.168.2.0/24 on another pi with same result. The 2nd test pi has fail2ban but all nothing special in iptables to block. Yeha i’m sorry i dont really want to give out SSH access to my pi, I would prefer the quick test tool. Thank you so much!! Any luck mate 🙂 ? 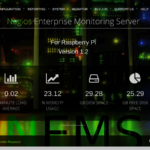 I’ve never used Nagios for monitoring before, of all the tools bundled in NEMS, how much of it is accessible with a REST api? I added the API based on user request, but have not used it myself (beyond deploying and ensuring it works, of course) – so hopefully this helps? https://github.com/zorkian/nagios-api/blob/master/README.md (Of course, the installation and config is already done for you on NEMS, so start reading at “API”). 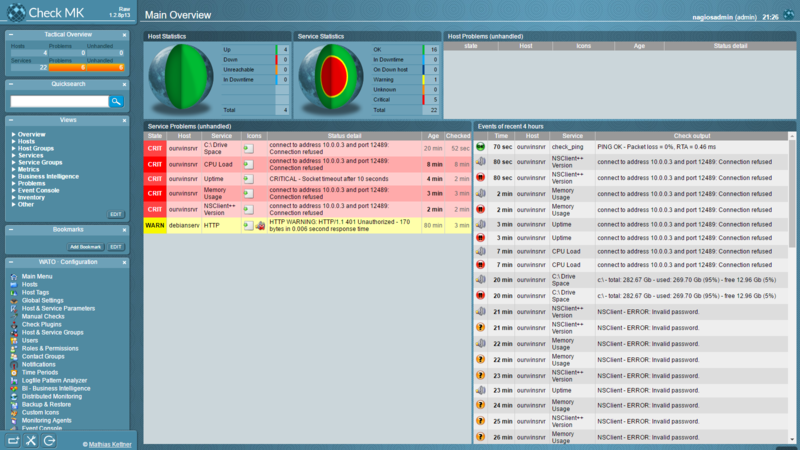 Is there any information about how many hosts or clients that NEMS is designed to manage? We’ve yet to encounter a scenario where NEMS is “maxed out” as far as number of hosts/clients/services go, so there are no numbers readily available. 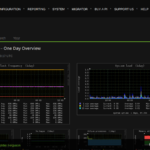 We have users running 100-200 hosts with nothing but praise for NEMS. Theoretically, as long as your MicroSD card is large enough, reliable and fast, NEMS should be able to handle several hundred (or more?) hosts. I look forward to someone trying with 500-1000 or more, because then we’ll really know more about how much it can handle. I might just have to try it out and see what it can do 🙂 in our network infrastructure we could potentially hit that higher range of hosts. I’d greatly appreciate you giving it a shot and reporting back. If you do encounter any issues, it’d be a great opportunity for me to optimize NEMS for such environments. Perhaps open a thread in the Community Forum for something like “NEMS managing 500+ hosts” or whatever it is. We can move the discussion there. Thanks! I have several different vlans on my network. I setup NEMS on my 10.10.60.x server vlan and I can’t access it from my 10.10.50.x workstation vlan. If I start a ping from my workstation to my NEMS server it will reply once eth0 enables for about 5 ping then it starts dropping. Is there a internal firewall that I need to disable on the system so all my networks can talk to it? Mind you I had this same issue on Raspbian, I was hoping I didn’t with NEMS.. What am I missing? I like your idea about a forum. It has come up before and you’re not the first to mention it, but I too feel that NEMS has now grown to the point where a WordPress comment system is insufficient. Re. your problem with setting IP’s in Webmin: can you walk me through the steps you’re taking (perhaps in the new forum?) and I’ll try to replicate and resolve this for you? Thanks! Afterwhich I ran the ‘sudo nano /etc/network/interfaces’ command and COMMENTed out all STATIC IP Interface references. … then SAVEd the file, ran a ‘sudo shutdown -r now’. Thanks for the post Hesh. I’ve not encountered this. Can you please post some info about it in the forum if it’s a bug and something I should be patching in NEMS 1.3? How can I check a non standard port using check_http? I’ll be including check_https in a future release as well, but this is Nagios 101 so you can get lots of help already by simply checking Google. I’m happy to help though, if I can. Lemme know where you’re stuck. Thanks robbie, its very hard going on the old brain. 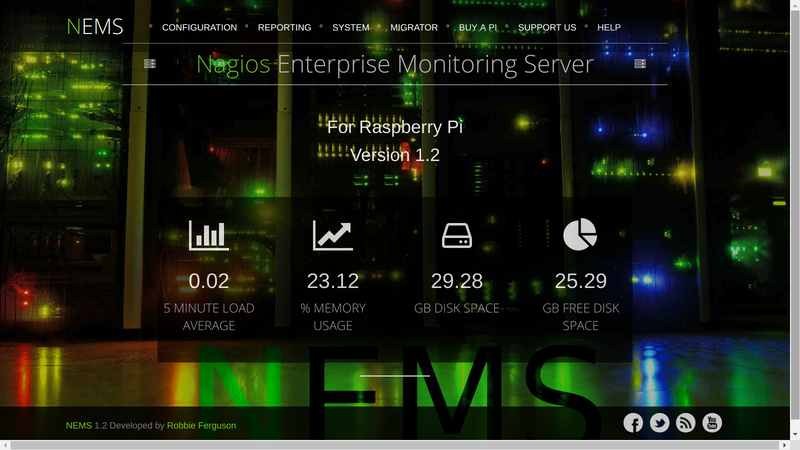 I’v had a manual install of nagios 4.something on a rpi for probably a year mainly to monitor my cctv system. I did the usual, ammend the windows.cfg with my pc & same with the printer…couldn’t get to grips with it. updated it to 4.3.2 the other day, struggled with lilac-reloaded..doesn’t work. 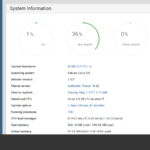 Found your distro, wow.. within a few hours practically every device configured! 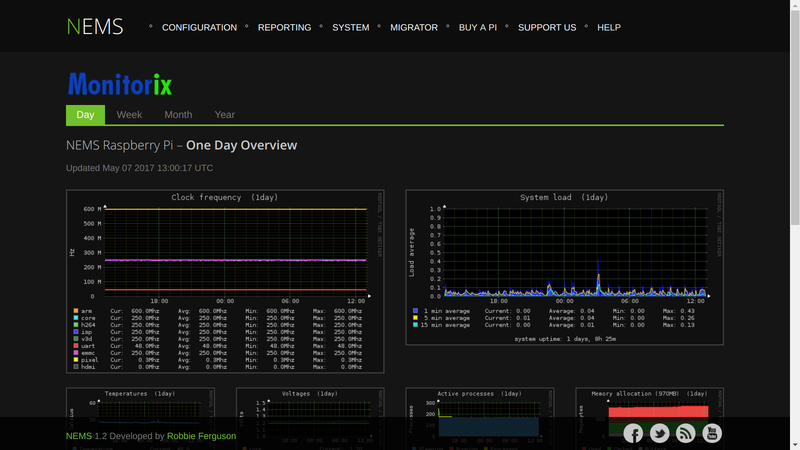 I’m still learning linux in general but i find the nagios help pages very difficult to digest. 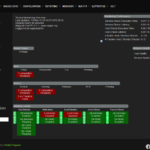 In my nagios4 (can’t remember location, think /usr/local/nagios/??) like the printers.cfg, windows.cfg and the files in in the folder above.. Where are they now? Can nconf create new commands? Otherwise where are the services.cfg? 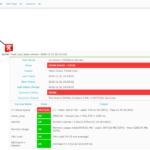 I was wondering how to remove a service from a host when it inherits from its hostgroup? 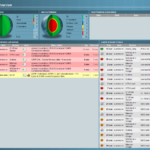 The hostgroups in NEMS are provided really as an example only to get you started. If they’re not quite correct for your environment, please modify them or create new ones. So if i remove a service from a hostgroup,then add that service to the host individually that would be a way? Is there any other way that preserves the template as is to serve the majority of devices but remove or ammend for the minority of devices, if you see what i mean. hi everyone i installed Nems on RPI3 and i want to create wifi access point by using hostapd and dnsmasq but it doesn’t work. This is not something I’d do on a NEMS server: it should be a dedicated NEMS server. 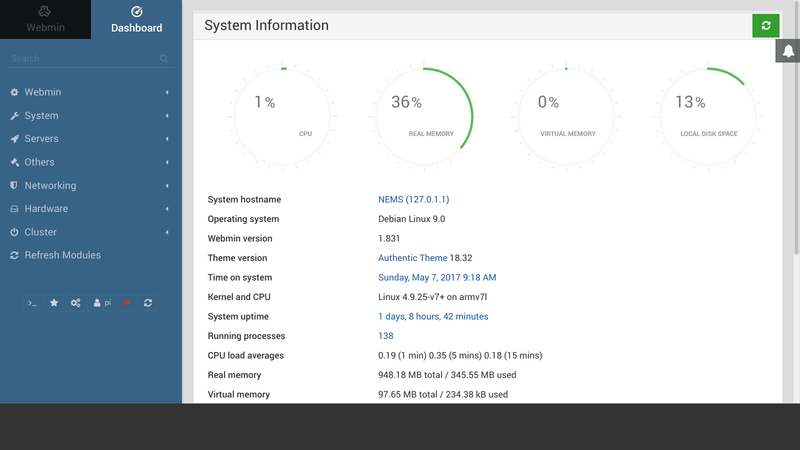 That said, NEMS is powered by Debian Stretch. 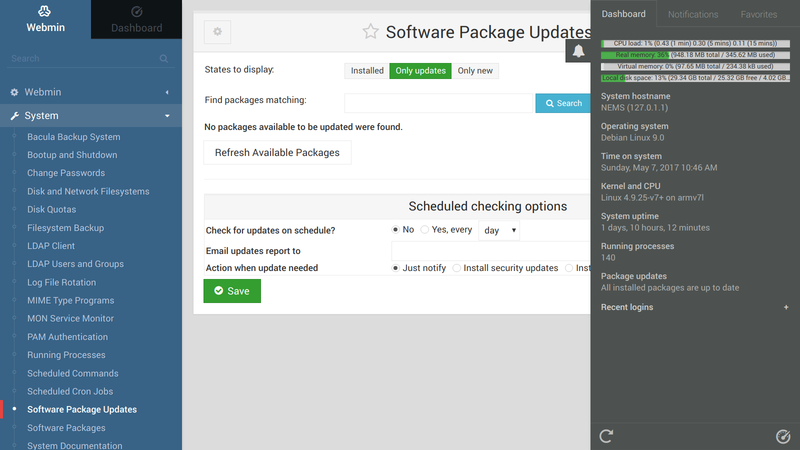 So if you follow the usual steps for Debian, that’s all there is to it (but this is not supported by me/NEMS). Oh–I see. So you wanted to be able to connect to the NEMS server as its own private WiFi network to separate it from your front-facing WiFi, rather than just connect NEMS to your existing WiFi network? Do I follow your reasoning correctly? If yes, please email me more information about what you did, and why. It may be something I can include in a coming release.